I was looking at odd bonnets and older style brimmed bonnets the other day. I even found an image with a 'pattern', if you want to call it that, which had no real information for me to use. I thought it would be fun to make my own long brimmed victorian bonnet, see what happens. The worst I could do was bo mb out, spend several wasted hours and then trash the project. When I started, I imagine that I felt a lot like milliners over 150 years ago …. First you make a pattern. 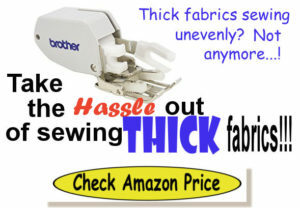 Then you cut and sew. Then, when it doesn't turn out like you thought, rip it out. Start over, trim and tweak the pattern. 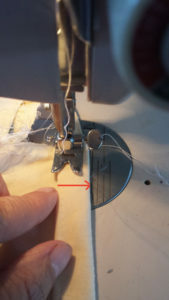 Sew again….until you get it right. that’s pretty much what went on with me too. 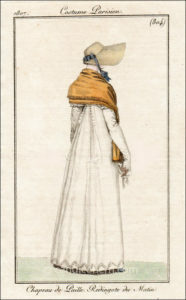 Though this long brimmed sun bonnet really is a combo of the two images I found, the length of the brim actually encompasses part of what would be normally considered a cap on a gathered bonnet. Essentially, the brim is almost the entire bonnet . The image at the right is one I wanted to try and as you can see, no real directions. But everyone loves a challenge, right? What puzzled me was the band at the back of the hat. In the end, I decided to combine the images I found with the 'pattern' at the back and disregard the band. Mainly because I was experimenting anyway and was using scraps and an old bed sheet before I tried using good material. Because of that, I knew making a band out of sheets probably wouldn't hold up or be sturdy enough. I'll try it next time, though. For the most part, I found that styles like these, or similar ones, were an earlier period than I had once thought. In fact. many were around the early 1800's rather than the mid 1800's. Many of them seemed to cross over in time and design. 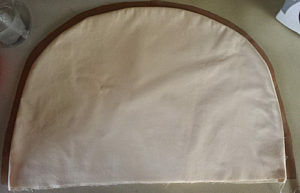 For instance, I found a long brimmed bonnet that was also considered a slat bonnet However, there were also slat bonnets that were shorter brimmed. These changes took place, as most do, over time as fashions and as personal tastes changed. The longer brim wasn't just for sun and wind protection, it was also a form of personal privacy from prying eyes for the ultra modest woman of that time. 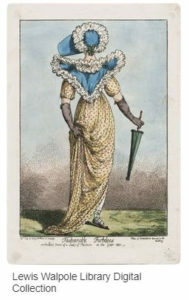 Some craved less privacy, others more, and often bonnets of a period could reflect those minor changes in design to meet the needs and tastes of the women wearing them. The gold bonnet at the right is, as you can see, a long brimmed bonnet, but it is also a slat bonnet. You can tell by the horizontal 'pockets' sewn in the brim that hold stiffeners for the bonnet to keep it from flopping or falling. Slipping slats inside the bonnet pockets kept the bonnet brim firm and free from being floppy or flimsy. 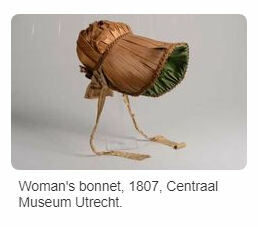 Clearly this is a bonnet that would afford the modern woman of the time some privacy. This bronze colored bonnet is from the early 1800's (1807 to be exact) and shows not only a longer brim, but a nicely rounded cap. Later on these caps also included a neck ruffle to keep poorer women who worked outdoors free from sunburn. The last one I looked at was….well….unique! I am pretty sure I would have declined to wear such a thing had I lived during that period in time. Look at the pic at the top left of this article.I thought the design of this bonnet was so unusual and from the angle of the painting, it appears to be a really long bonnet brim. I am not sure of what style this would be called, but I decided to coin it the Tunnel Brimmed Bonnet. Fits, don't you think? So now I figured I was ready to make my own. A sort of mix and match of our current gathered sunbonnets and the historical pictures I found. 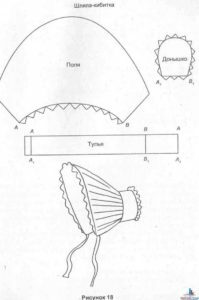 I did a search for some older style and unique Victorian kind of bonnet patterns and while I didn't find any patterns per se with instructions, I did find many bonnet diagrams. But because they didn't have any instructions with them, it was up to me to experiment. And oh how I love to do that! So I found two images I thought would work. I picked them and then combined them to make a long brimmed bonnet. Because this was an experiment, I really didn't want to waste the money on $15 a yard material. Instead, I went to the local thrift store and bought a colored sheet and a pair of denim jeans for the insert. Sheets are quite a bit different to sew, so t knew the results wouldn't be the same. However, since I was just testing, I figured it would work for this purpose. Please Note that this experiment of mine is in no way about an exact replica of anything historial. This was just an experiment I did for me…just for fun. 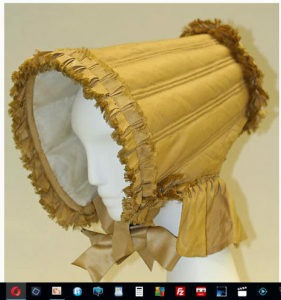 If there is a historical bonnet like this, then I got lucky. 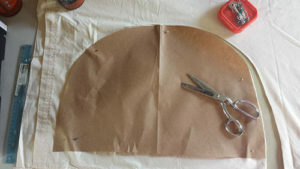 Using plain brown paper to make patterns, I cut a rounded piece out 24 1/2" x 13 " Inches to make the long brimmed bonnet pattern piece. Because the sheets don’t have the weight of good material, I cut four pieces out for the bonnet brim instead of the two I would normally cut from standard material. I pinned all four layers together to make sure the edges matched. If they don’t, and most often that will happen, trim the edges. 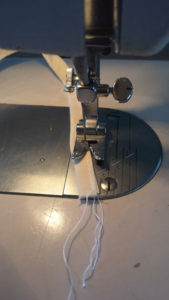 Sew the edges together using a traditional width seam, or like I did, sew the width of the foot. 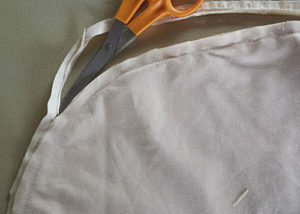 Trim close to the stitched edge. 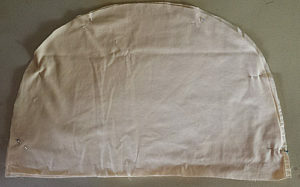 Turn the long bonnet piece around so that the inside is on the out and press with a hot iron. 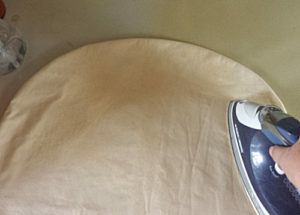 Sheets, being cotton, will take a good hot iron but it’s easier to get it to press after sprinkling lightly with water. 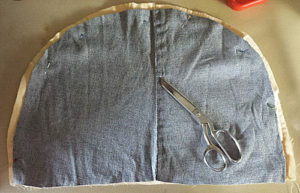 Usually patterns will have a pattern piece that can be cut to readily fit inside so that you can sew the insert along with the upper and lower bonnet brim piece all at once. 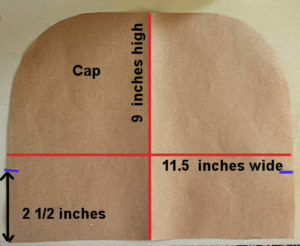 But since I’m guessing at sizes to start with, I just put the sewn bonnet brim top over the brown paper pattern that I used to cut the original four pieces. I just wanted to get an idea of what the size of the denim insert needed to be. I make a second pattern from the very first one I used to cut the four bonnet pieces. I used this to cut my denim insert by cutting the sewn brim to the paper. Then I cut just a bit more off the edges of the paper to make a useable pattern for the bonnet brim insert made. This is the denim insert I cut from my second brown paper pattern. I think pellon would be a much better choice resulting in a firmer brim and a bit easier to sew, but this will work just for this testing purpose. This was a bit of double checking on my part, so I put the denim over the top of the brim I already sewed, then pinned it in place so that I could trim the denim to the just a bit inside the sewn part. I wanted to make sure if fit inside the bonnet brim comfortably without bunching up in places and that it matched the pattern piece I made for the insert. 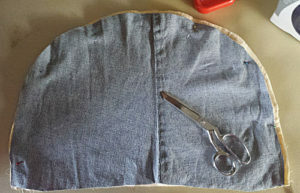 I slipped the denim inside the bonnet brim 'pocket; and then pushed it to the edges so that it was seated at the inside of the sewn seam. I pinned starting at the top center on down while I pulled the fabric tight. I worked my way to either side and pin both the right and the left to keep the material in place. I sewed the outermost edge about ¼” from the edge. After that, sew about 1 inch from each previous row. 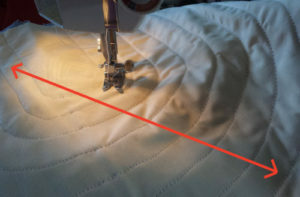 Because the brim is longer than usual, and because sheets aren’t the best sewing material, I found it easiest to tug the material slightly catty corner as is ran under the needle. Be careful when you do that so that you don’t pull the material too hard when running it under the needle. 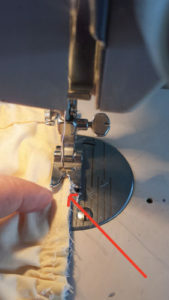 I have a walking foot, which is supposed to keep both the top and the bottom layers of material even without puckering, but I’ve never really had good luck with it because I bought the wrong one and it was never a good fit for my machine. If you do use one, that’s great. Since I didn't, I just stayed with my standard sewing foot until I order one that fits. I sewed ten rows on this brim about an inch apart, and depending on how you might have your machine marked, or how far or close you like your seams, you may have a few more or a few less. This quilting gives strength to the brim and keeps it from flopping. When done, trim the raw edges. For the most part, I've only seen bonnets with ties and draw strings. Many modern replicas will use elastic but I really don't like to use it for one simple reason. 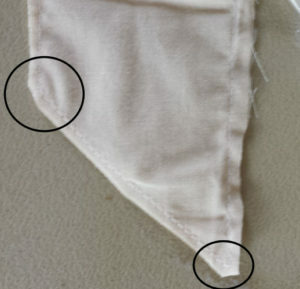 Once the elastic is sewn in, that's the size the bonnet remains. If it is too loose a fit or too tight, it can't be adjusted while drawstrings can. I cut two strips for the ties that will be inserted in the casing of the back bonnet piece. 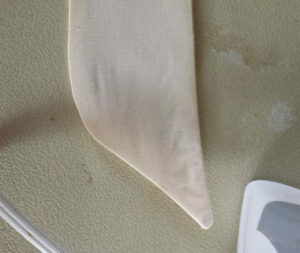 These ties are to pull the cap in a bit tighter at the neck edge. Each piece was about 8 pieces long and 1 inch wide. Fold each edge inwards at the center and then fold in half. Top stitch the edge. I know this looks like the same piece, but it isn't 🙂 It's a shorter and narrower version of the long brimmed sun bonnet piece. I cut this about 9 inches high and 11 1/2" wide. The markings at the bottom let me know (and now you know too 🙂 ) that the basting stitch will start 2 1/2 inches from the bottom ending on the other side, again 2 1/2 inches from the bottom. Since this is not an actual historical piece bonnet, and since I am experimenting…and since I'm having fun with it (yes, I did, really!) I decided I wanted the ties on the outside. After top stitching the casing, I cut a little notch in the casing on the OUTSIDE of the bonnet so that the drawstrings looked like an extra embellishment. It's just as easy to me to make the notch inside and then tuck the drawing strings inside the finished long brimmed bonnet if I wanted. Well, maybe next time. 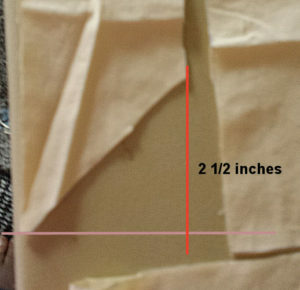 I sewed the casing at the bottom by folding over about ¾ of an inch. This will give me enough room for the ties and leave enough room to fold another 1/4 inch of material under to top stitch. When I was finished, I ran a basting stitch from about 2 ½ “ from the bottom of each side. I pinned the pieces from bottom edge of the bonnet brim part to the bottom edge of the cap part. 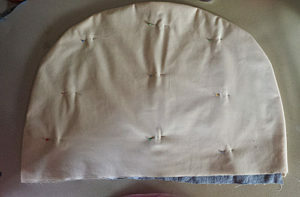 The three pointers at the top show that I gathered and pinned the cap to the brim as evenly as possible while the bottom left arrow shows that I matched the brim corner with the cap corner. Before sewing, I made sure my ties were already pulled through the casing before I stitched cap and brim together. To make a showier set of ties, I thought they should be sewn together and then pulled inside out. 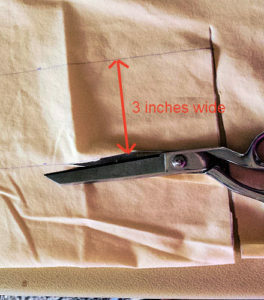 The easiest way is to just cut one tie and then fold the side edges under and top stitch. I wanted something a fancier. So I cut 4 ties. Each tie I sewed together, then trimmed the bottom corner and points and then pulled them inside out. Each tie was cut at 3 inches wide and 24 inches long. After I sewed them to the bonnet, though, I thought they could be a tad wider and longer still. Just a personal choice, though, on my part. From the corner of the bottom of the tie, I angled upward about 2 1/2 inches on the other side and then cut at that angle. This gives me a classier looking tie than the straight bottom edge kind of tie. Still should have pressed before I took a photo! While it was still inside out, I cut the tip of the tie and the corner edge. This makes is so much easier to sew when I pull it turn the ties inside out again and top stitch. 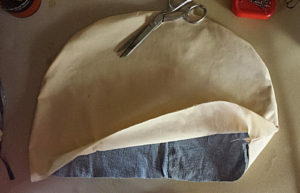 Often, especially if you take a larger seam, the material bunches up in these corner and this way I won't have those lumps when I get ready to do that last bit of stitching and pressing. After pulling the ties inside out and pressing, they look like this. Since the tip and the edge didn't have a bulky look to it, and because pressed it didn't look like it needed top stitching, I skipped that part. I do believe, however, depending on the type of material I use next time, I might just top stitch anyway. Or, again depending on the material, maybe use a contrasting color of thread. Even though the tie ends on the top won’t be seen, I wanted a more finished product so I folded the top of each tie down and inside the tie itself. 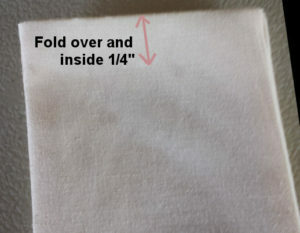 I folded approximately ¼” inside and then pressed the tie with a hot iron. Then I top stitched. After that, the ties can be sewn to the bonnet. I sewed the ties approx. about 2 inches from where the cap and brim were seamed and zigzagged. 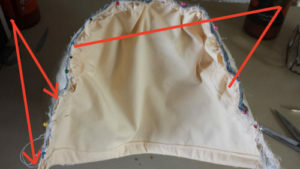 Follow the top of the stitching on the upperside of the bonnet so that it looks like part of the bonnet brim stitching. This experiment was fun and oddly satisfying even though I didn't create anything spectacular. And I certainly didn't create anything period correct either. But I did find myself truly admiring milliners from so long ago that put such painstaking time, care and effort into their work , the results of which we see today in museums and historical books. For sure, though my project was small, it made me realize what effort goes into creating the hats that have covered the human head for centuries. So…now that I have shown you my project, warts and all, …I would so love it if you tell me what you think and if you post your hat projects as well ! I was trying to visualize it as you went…..but oh my goodness…that is amazing! I love it! Truly beautiful. You really are talented. I wish I had seen this when my granddaughter was needing one for a school outing. I had one muddled together….this would of been beautiful! Thanks for stopping by 🙂 This was something I felt like giving a try…I’ve seen so many bonnets and wondered how they all went together. Though there were not many pieces to this, as you read, it was still more work than I thought it would be. In fact, I can imagine how hard it was for original milliners. Probably, once the main pattern was made, all they had to do was tweak things a bit to fit the head sizes of individual men and women. But now I have another bonnet I can’t wait to try! What a fun project! Reading through the article, I actually wanted to start making my very own!! I love your finished bonnet, it turned out very nice and you made it sound so easy with your instructions. Thank you for posting this!